New 1963 Autocar owner from Wisconsin here. My father had bought this truck 5yrs ago. It has been sitting with intent of him and I restoring it. 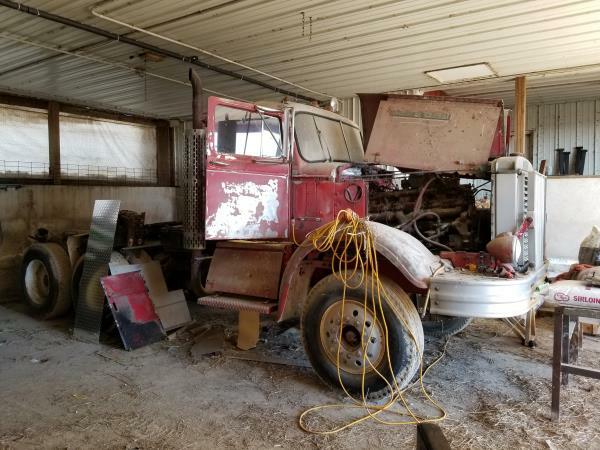 My father (58) drove a '63 Autocar dump truck back when he was 18 (his first truck). We're in the hunt for a good quality driver seat, passenger seat/box, hood, headlight bracket and whatever you may have or know of whom may have it. Its work in progress and will keep you guys posted! Nice looking truck. Keep the pictures coming ! welcome to our little corner of the world. lot's of A-Cars around here. I cried because I had no shoes till I met a man who had no class. Neat old truck, jfab. What model is it-A7564 maybe?